The secret to Brooks’ success as a Manhattan gym owner? Being motivated to disprove everyone who doubted him long ago. He’s not about to let a perky newcomer like Izzy tarnish his reputation. Even if watching her lead a salsa class on his premises is fuel for some very unprofessional fantasies . . .
Every time Izzy slams Brooks in her fitness blog, her book sales soar. But when their escalating media feud forces them to be up-close-and-personal for two weeks, she realizes there’s much more to Brooks than that incredible body. Soon Izzy and Brooks are finding all kinds of creative ways to work up a sweat. A passionate workout is easy, but can their rivalry give way to a lasting partnership? This is the second in the Brits in Manhattan series. I enjoyed the first one so much that I was eager to get my hands on this one. No worries if you didn't read the first, this can be enjoyed without. The characters in the first story are only present as a group of friends and in no way do this influence this story or is their backstory relevant to this story. Normally I get frustrated pretty fast with the whole hate at first sight love story. This was not the case with this one. I actually found it hilarious. I think it was because the characters were actually declaring war on each other and it was fun watching it play out. Knowing how it would turn out added to the fun. I found myself identifying with Brooks more than Izzy. This was really only because I agreed to his approach to health and fitness vs. Izzy. Her approach is actually dangerous, and honestly, I could never live without meat so I naturally sided with Brooks. Not to mention that as the reader we actually get to know more about Brooks than we do Izzy. At the end if the day, this is a fun story that is part of a fun series. I am hoping there will be a third and I will be in line to read it! 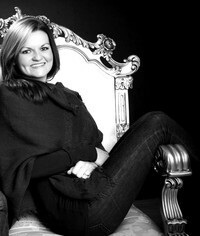 Laura Carter is the bestselling author of the Vengeful Love series. She writes from her beach home in the Caribbean where she lives with her husband and (gorgeous) dog. She loves all things romance, including paper hearts, flowers, chocolates and champagne (not necessarily in that order). If she isn't writing or hanging around on social media, you can probably find her watching a romcom with a tub of Ben and Jerry's.